Friends and supporters of Ferguson Police Officer Darren Wilson held a rally in support of him and the St. Louis County police force in downtown St. Louis on Sunday. 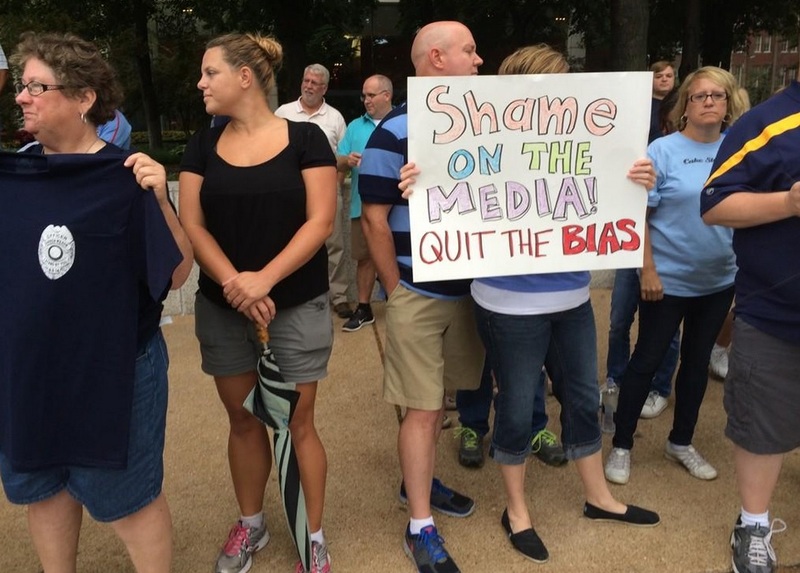 The protest was held outside the headquarters of NBC affiliate KSDK News, which broadcast footage of Darren Wilson’s home. Officer Darren Wilson’s friends and family have decided to not speak publicly about the incident. His close friends include working families with children who are worried about the safety of their own family members if they were to go public in support of Officer Wilson. However, The Gateway Pundit can confirm that at least one local St. Louis area school has been placed on lockdown for fear that children connected to the department may be targeted. The school is on high alert. And, Officer Darren Wilson has received numerous death threats including threats that describe how they will murder the officer and his loved ones.